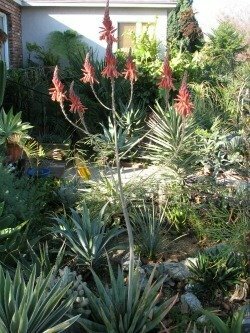 This article is about what is blooming in December in the succulent garden, from a Southern California point of view. 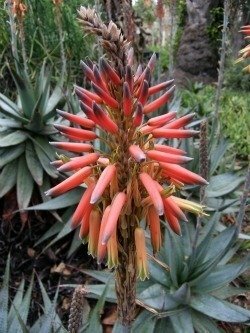 If you live in California, or are just visiting, wouldn't it be nice to know what sorts of things are blooming each month so one could decide whether it might be worth it to visit a botanical garden, or go on a garden tour? 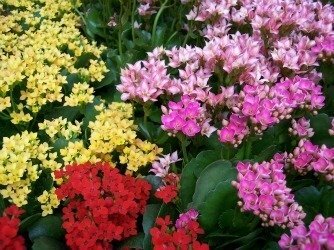 Of course, most people know when most of the "real"flowers bloom, like roses, irises, camellias etc. 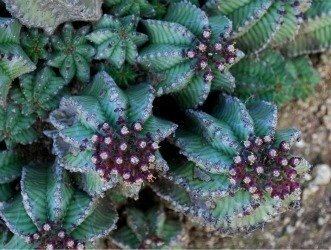 But many others don't seem to be quite as familiar with what's blooming in the succulent world. 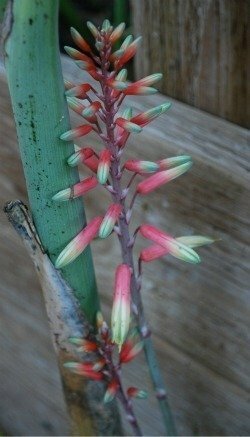 So this will be December's edition of what you might want to look for or expect to find. 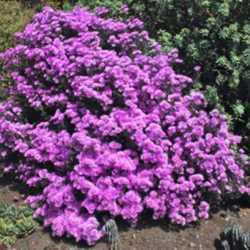 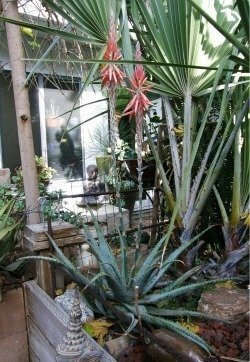 I will skip the plants that realistically do not grow outdoors in California or are just too small, or have flowers too boring to include. 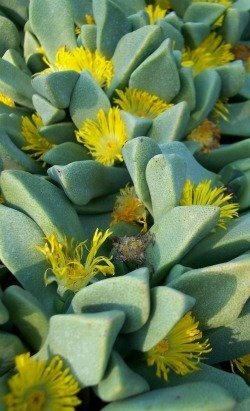 This will allow me to leave out about a quarter of all the succulents I know anything about, and about all those I know nothing about. 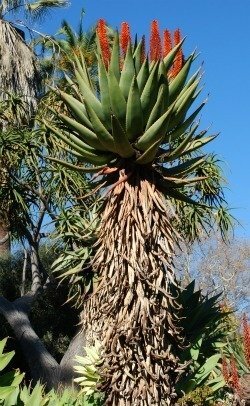 But don't worry... there are still plenty left over to start with. 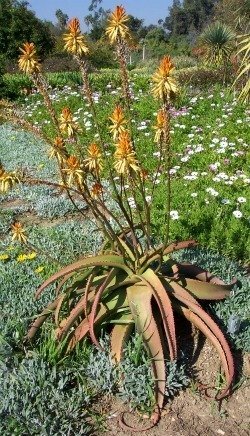 Aloes: As far as succulents go, December belongs to the Aloe. 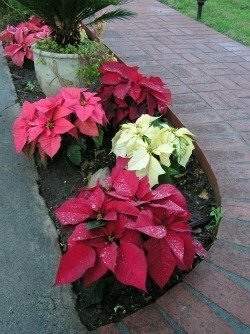 December is a pretty big month for them, though not the biggest. 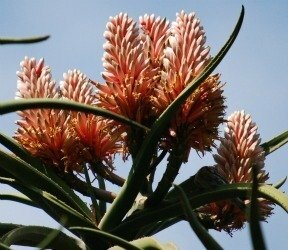 I cannot realistically include all the aloes that bloom this month, nor do I even have access to photos of all the species anyway. 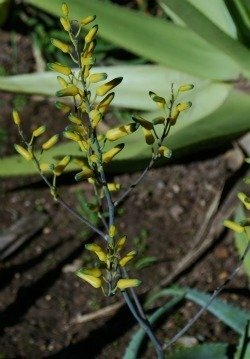 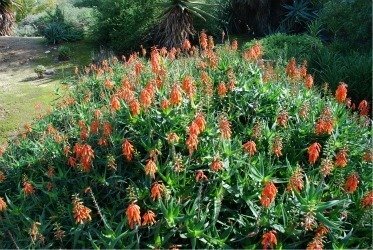 But these following species are among the ones I see flowering in my yard in December, or ones you would likely run across when visiting a botanical garden, or the garden of an avid aloe collector. 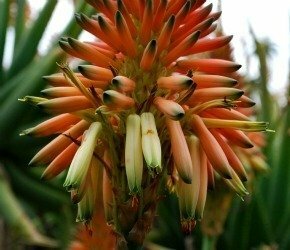 By far the most commonly visible Aloe in all of California is Aloe arborescens. 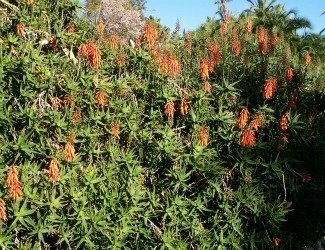 There may be a few other species more commonly planted, but this one is much larger and takes up far more room than any other species. 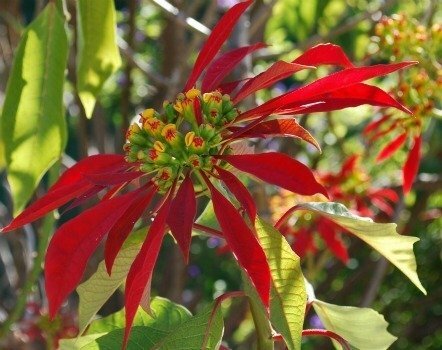 It has deep red (or yellow) blooms that show off from late November through February, primarily, and though the main season is January, finding one in bloom in December is certainly not unusual. 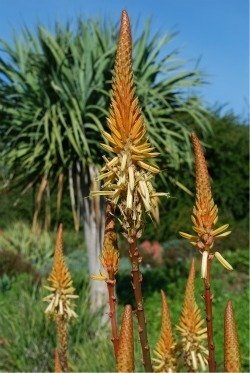 Aloe arborescens usually has red flowers (left) but there are some strains that make a yellow flower like this on in the Huntington Gardens outside of Pasdadena, California (right). 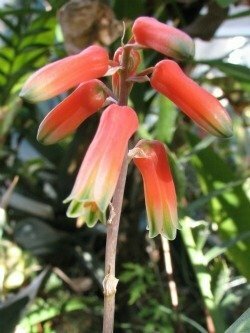 Though the same species, these two color varieties tend to bloom at slightly different times with the yellow form being a predominately December bloomer and the red form being more variable, blooming from November to almost the end of spring. 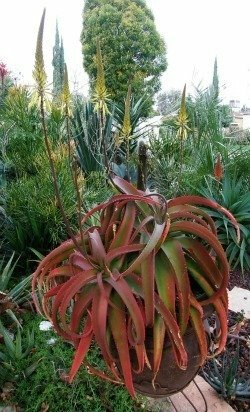 Aloe barberae (aka bainsii) is the hugest of all the Aloes and this is the time of year it shows off that it has more than just bulk to offer. 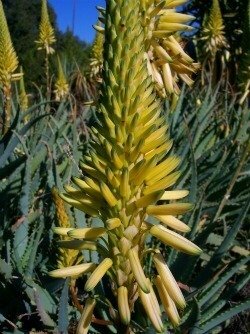 Aloe ciliaris is a nice vining species that blooms irregularly for most of the cooler months, but December and January are its main times to flower. 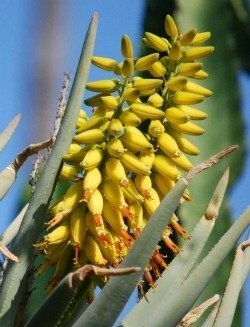 Aloe dichotoma, another of the monster species, is primarily a December bloomer showing off its brilliant yellow flowers. 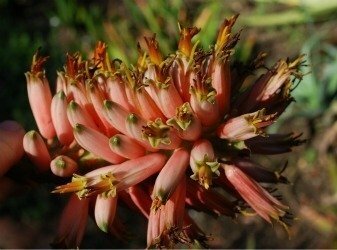 Aloe ramossisima, often considered the same species, only a shrubbier version, is also blooming best this month. 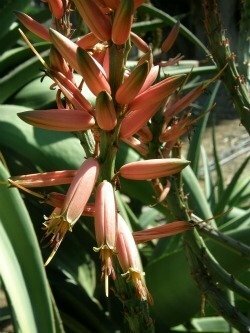 This plant is a lot less predictable in the blooming department, however. 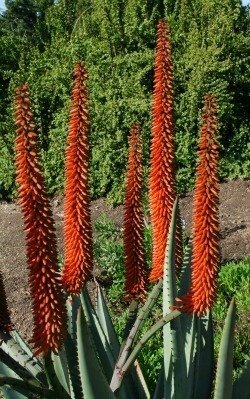 Aloe ferox flowers for several months and December is not its big one, but it still can display some striking inflorescences this month. 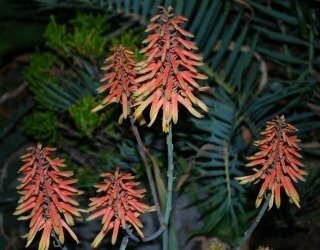 One of my personal favorites is Aloe petrophila, a smallish, moderately colorful spotted aloe from South Africa who really cranks out a ton of gorgeous candy-striped flowers in December into January. 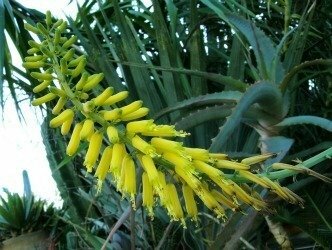 Aloe suprafoliata is one of the common aloes to start the winter flowering season and December is its month to be a star. 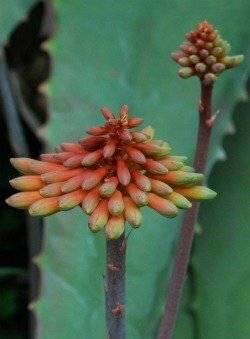 Aloe suprafoliata has nice flowers, but the entire plant is attractive and makes a nice addition to a garden, with the turquoise leaves (left) or purple leaves if really stressed with drought (right). 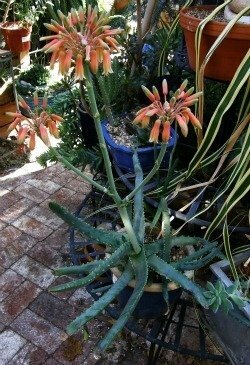 This plant on the left is one of the first plants in my yard to flower each 'aloe season' and lets me know it's that time of year. 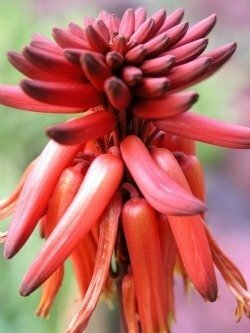 Aloe vanbalenii is a commonly grown species that starts out this month but finishes off in January and February. 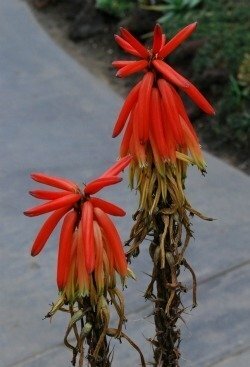 Aloe vanbalenii looks great as a colony plant or as a potted specimen, and looks good year round, though best in winter. 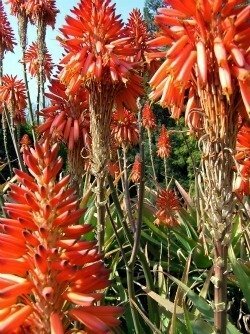 One of my favorite holiday season aloes is Aloe pretoriensis, with a beautiful candellabra-like inflorescence and bright red, festive flowers. 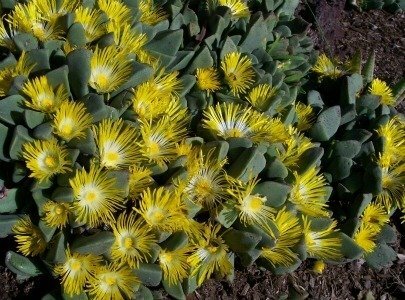 These shots are from my yard. 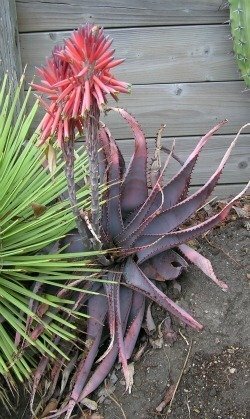 This is a pretty easy-to-obtain aloe. 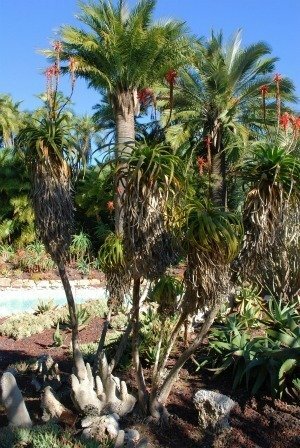 I have no idea why it is not planted more commonly. 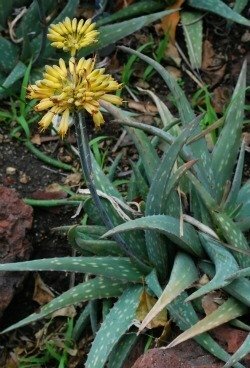 Aloe tongaensis was for many years assumed to be a form of Aloe barberae, though smaller. 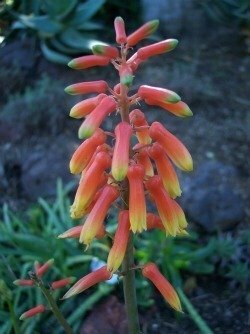 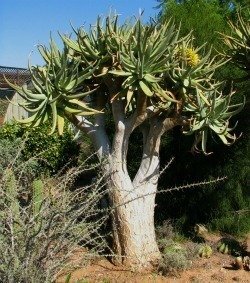 Then it was called Aloe 'Medusa'. 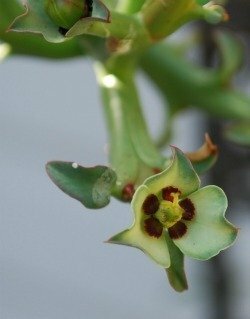 Now it finally has a species name. 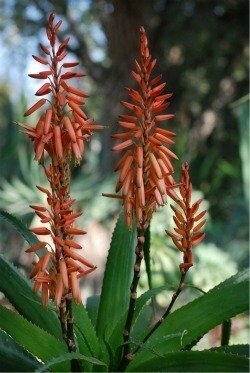 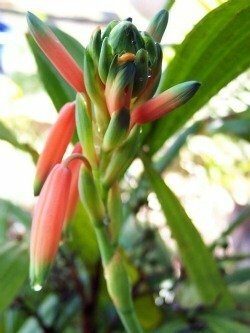 Its flowers are different from Aloe barberae in that they are pale orange instead of pink, and have long peduncles and are a different shape. 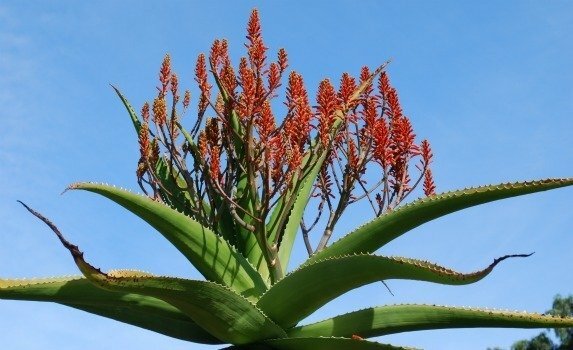 But the plant itself looks very similar (left); right is not really a species, but a hybrid of Aloe barberae and Aloe vaombe, called Aloe 'Goliath'. 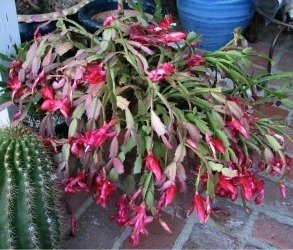 Like its parents, it flowers in December as well (right). 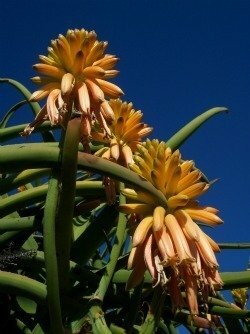 This Aloe vaombe in the Los Angeles arboretum is fully flowering in December. 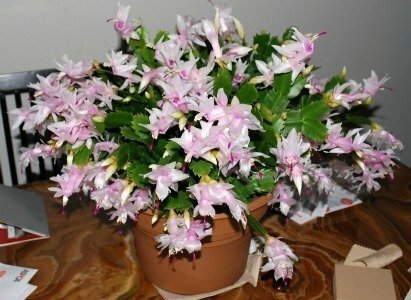 Mine wait until January to February for some reason. 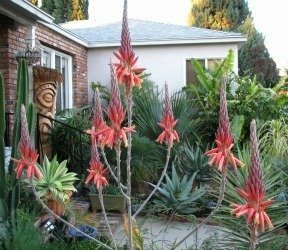 This is not unusual, however, to see aloes flowering in different months in different locations about southern California and is probably due to local temperatures and exposure. 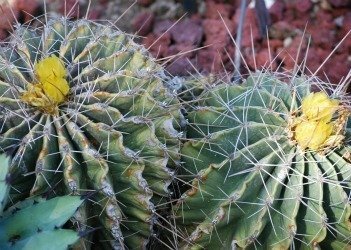 Cacti: December is not a big month for Cacti as winter is not most cactus's favorite time of year. 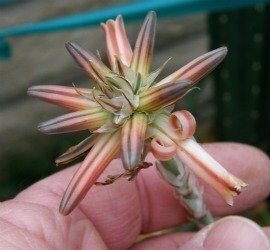 But for some reason, there are a few species that either only bloom this time of year, or include December as a month to make flowers. 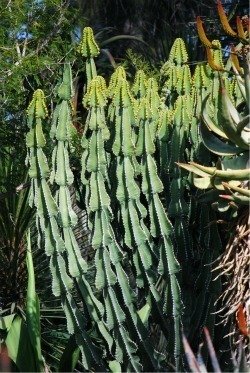 The following are some of the ones I have happened to photograph. 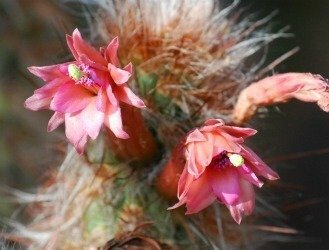 And of course Christmas cacti bloom this month, though sometimes these need some 'daylight manipulation' to really bloom nicely (like the one on the right). 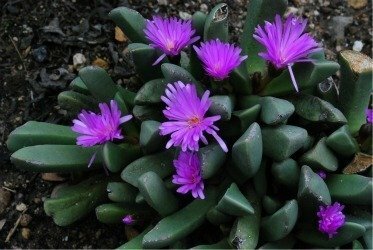 Crassulaceae: The family Crassulaceae has many members that bloom primarily in winter and a few chose to do their thing mainly in December. 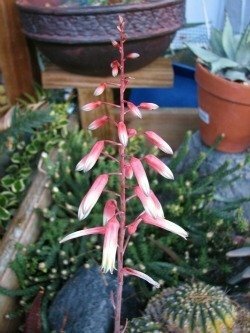 But for the most part, the other winter bloomers wait for a month or two to show their flowers. 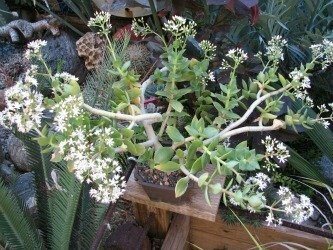 The most well-known of the Crassulaceae December bloomers is of course the Jade Plant, Crassula ovata, and all its cultivars. 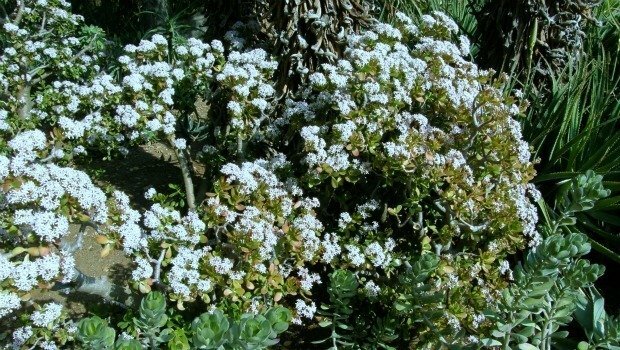 The blooms, like most of the Crassulas, are not that impressive and one would not likely visit a garden to see this plant in bloom, when frankly it looks nicely NOT in bloom. 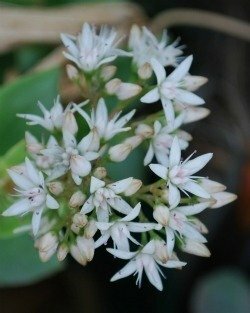 Another Crassula that blooms only in December is Crassula lactea. 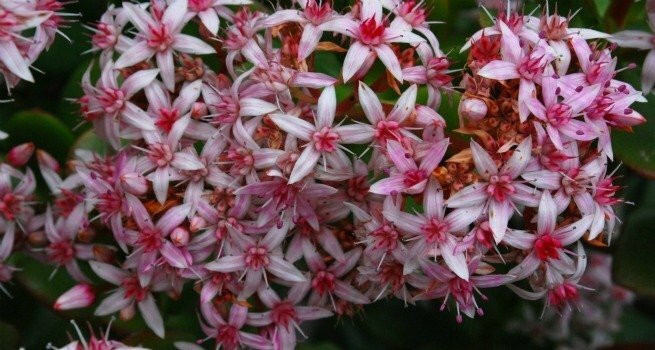 The blooms are very similar to those of Crassula ovata. 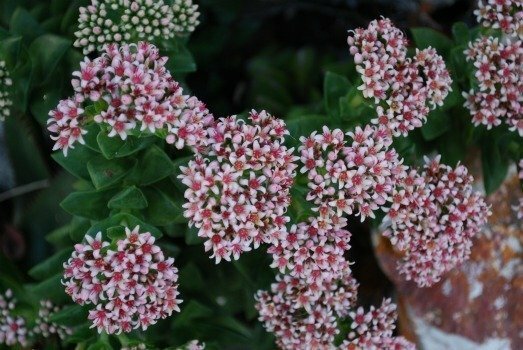 by far my favorite December bloomer in the Crassula family is Crassula 'Springtime', inaptly named as it blooms year round. 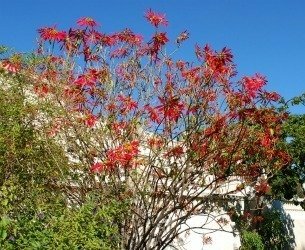 It just happens to also bloom in December. 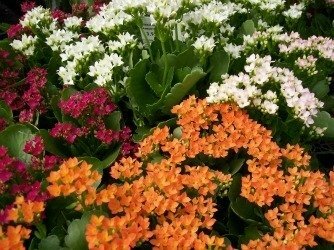 one of the more popular plants for the holidays as Kalanchoe blossfeldiana, which is usually in nurseries and plants shops this time of year (though this species does bloom most of winter into early spring). 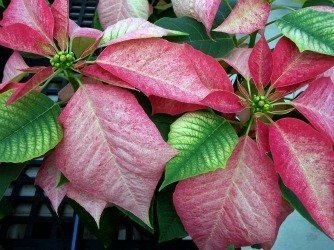 Euphorbias: This is not a huge month for Euphorbias, either, with the obvious exception of one of the symbols of the holiday season, the Poinsettia. 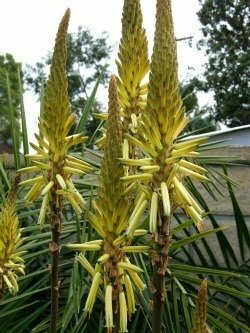 Though the best part about these festive plants is not their flowers, which are actually miniature yellow structures almost completely overlooked. 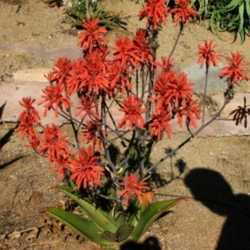 But it is their bract-like red, pink or yellow leaves that surround the flowers that one associates with this species. 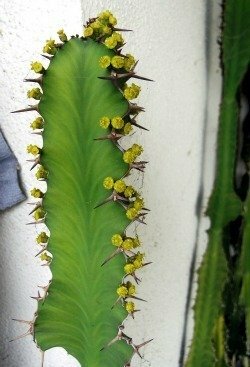 There are a few other Euphorbia species that can often be found making flowers in December. 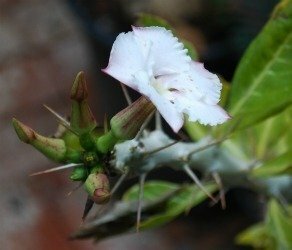 Euphorbia angularis, not a super popular species, blooms readily in December (my yard- left); right is normally a pot plant, Euphorbia anoplia, but also a decent landscape plant in the right circumstances. 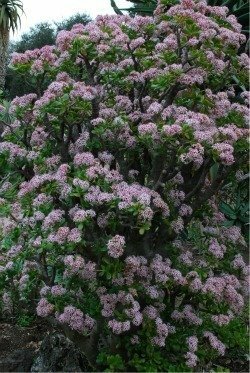 It is also an early winter bloomer. 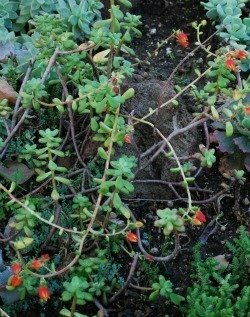 Other Succulents: a few other succulents, one which I have several of in the yard, bloom primarily or only in December. 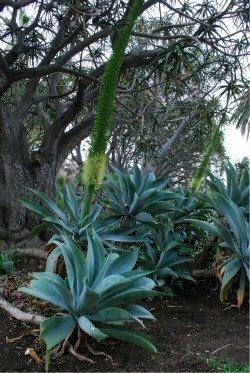 Agave attenuata 'Nova', a blue form of Agave attenuata that makes an monolithic upright flower stalk (compared to the drooping one the normal form makes) is just one of many Agave species that bloom in December. 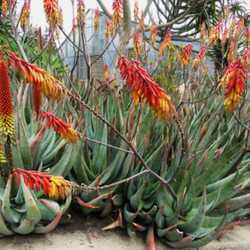 Agaves however, only bloom once and that's it, so unless you are planning to visit a large colony of them (as above at the Huntington), a traveling to a garden to see Agaves flower is likely to be a dissapointing trip since it is hard to know what year each plant is finally going to end its life in this spectacular fashion. 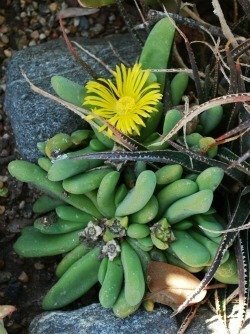 There are dozens if not many dozens of other December bloomers in the succulent world, but these are at least a reason to get up and visit the southern California botanical gardens in December, a month not often thought of when considering flowering events. 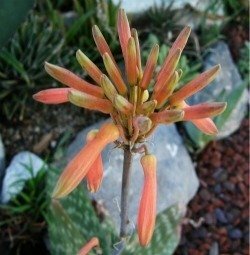 Succulents: What's Blooming in the Yard Now? 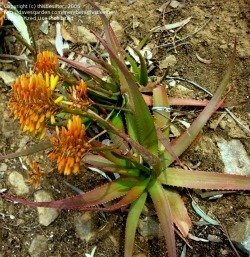 January Edition What's Blooming in February? 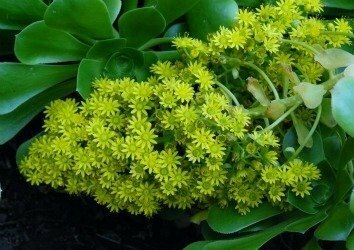 The Big Month for Flowers in the Succulent World. 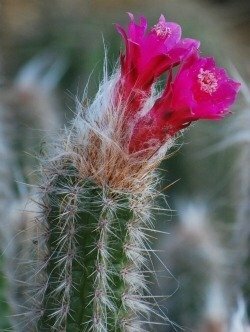 What's Blooming in March? 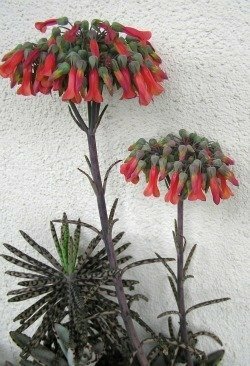 Succulent flowers of the Southwestern U.S.